On the surface, The Aliens (currently on stage at Coal Mine Theatre) doesn’t seem to have a lot going on. There’s not much of a plot, not a lot of action, and not a lot of dialogue. But like a skillful artist can do with just a few lines on paper, Pulitzer Prize-winning playwright Annie Baker creates a rich emotional world with seemingly little. 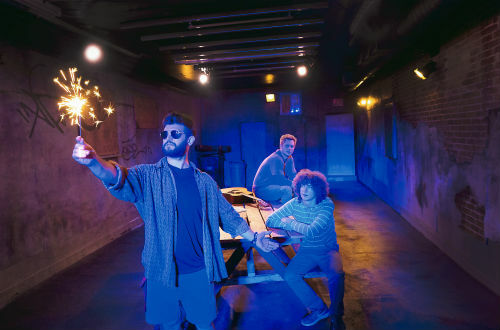 The play is set in a grungy alley behind a coffee shop in small town Vermont in early July. Two thirty-something misfits have made it their hangout. Jasper (Noah Reid) and KJ (William Greenblatt) used to have a band called The Aliens. But now they sit around smoking and talking about everything and nothing in the way old friends with too much time on their hands can do. Evan (Maxwell Haynes) is an awkward, naïve teenager who works at the coffee shop. When he gets sent outside to ask them to move, he slowly gets pulled into their world. Nothing is explained in a straightforward way in this play. Instead, through an aside here or what seems to be a throwaway comment there, we learn that Jasper never finished high school and that he has recently broken up with his girlfriend. KJ has dropped out of college and has some sort of mental illness. Details about the characters are revealed slowly, bit by bit, and we are never sure exactly what is going on. Slow is the operative word here. Baker’s dialogue moves at the pace of real life. And not a lot happens. There are long periods of silence and all the “ums” and “yeahs” and “likes” of modern casual speech. Yet hidden in these pauses and unfinished sentences is real poetry. Baker conveys both deep friendship and deep pain with just a few words. Maxwell Haynes gave my favourite performance of the night. He perfectly portrayed the nervousness and sweetness of a teen both terrified and in awe of the hipper, older pair. He is thrilled to be noticed by them and taken under their wing. Reid and Greenblatt’s performances were also moving. Reid’s Jasper was intense, on-edge, and slightly threatening. Greenblatt’s KJ was mellow and a little spaced-out. Their friendship seemed real and surprisingly touching. Coal Mine Theatre’s oblong space was an ideal venue for The Aliens. With just a few garbage cans, chairs, and a battered picnic table, the space was transformed into an alley. The small room added to the sense of intimacy. I wasn’t sure how I felt about The Aliens when I left the theatre. But as I rode the subway home, I kept revisiting different moments and bits of dialogue. It stayed with me and continued to affect me the more I thought I about it. It’s a small, spare, beautiful play: go see it. The Aliens is playing at Coal Mine Theatre (1454 Danforth Avenue) until October 8, 2017. Performances are Tuesday – Saturday at 7:30pm and Sundays at 2pm. Tickets are $42.50 and can be purchased online. $25 rush tickets (cash only) are available at the door 30 minutes before the performance, subject to availability.